I had an experience this week that I made note to share with you. After the communication in question, and based on emails from my readers, I know that many of you have been in the same situation. I responded to an email that had several comments, that, based on knowing this person for some time were a bit disappointing. And that’s the word I used when I emailed back my response – disappointing (although one could easily say it was insulting). What they typed didn’t apply to me or anything I had done or not done. So in my reply I asked for clarification. How can you not take an email personally that was sent to you? It was sent to YOU and the message is addressed to YOU. Now, I’m not one of those overly sensitive people who reads things into emails that aren’t there. However, when comments are directed at me it is difficult not to. This individual put their lack of professionalism on display. If you are having a bad day, or believe that something needs clarification, you do not do so by making statements that are not accurate or accusatory. You should never put a business contact in the position of having to deal with and compensate for your knee-jerk communication. That is not the mindset of successful professionals. When you question someone’s ethics or integrity without any direct reason to do so, it is personal. When you make accusatory general claims, because you are having a bad day and didn’t take the time to investigate further — that’s on you. The situation I experienced this week could have been avoided — easily. By first investigating the situation at hand (past communications and documents) to have a better understanding of what was going on. Then, by taking the necessary time to ensure that what was typed is what was meant — and accurate. But we were rushed and frustrated and I was the lucky recipient. Clearly this individual felt that their explanation was enough of an explanation or an apology. Although that word was not typed. When you make mistakes or are misunderstood because you did not do your due diligence, own it and apologize. You do not make excuses and you certainly do not trivialize abrasive comments by claiming you didn’t meant them. In business, there will always be those who type what they want without taking a moment to review. They do not think about whether their questions/challenges are apropos or even accurate. Because of that many a business relationship will suffer or be jeopardized. You cannot say “it was not meant” or that “you didn’t mean to” if you typed it! The words you chose to type are what you mean! Otherwise why would you use those specific words? Words have meanings and you simply cannot expect that the other side will know what you mean if you don’t communicate with crystal clarity. The reality is what is typed is meant. At that moment in time. It is more poignant when it is someone you know (or thought you knew). Those who recklessly type in this manner tend to be those that are not used to be questioned or challenged directly about their comments or approach. Being a skilled communicator, I can do that in a way that makes my point, without offending or making the sender feel that they are being accused or confronted. If this individual would have taken a moment to review their email (or read it out loud), there is a chance that they may not have sent the email they did. They claimed they weren’t thinking — they were in a hurry. But they are not apologizing which further indicates they typed what they meant. Some contacts may not be as understanding as I was in this instance. We had a history so I did my best to not allow this one email to negate all that. But as will always be the case in these situations, my opinion of this individual did change. You are what you type; you are the words you choose to use. Know that what you type will be taken at it’s face value by the person on the other side. They will take you at your word(s). Without a doubt most likely effecting your business and professional relationship. And, possibly your reputation. An easily avoidable adverse impact. Why risk being misunderstood or having a contact’s opinion of you change negatively simply because you didn’t take the time to be super clear? It is worth your time and effort to make sure that what you type is in fact what you mean? And that it is an accurate representation of the situation at hand? Absolutely — your bottom line depends on it! 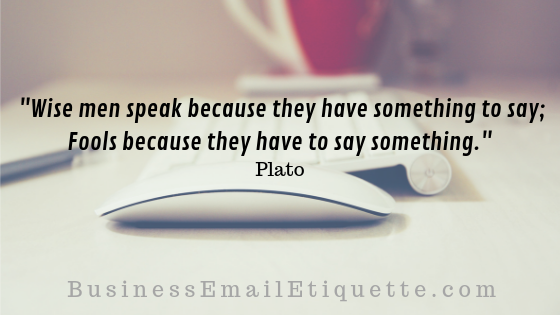 Have you experienced a misunderstanding in a business related email due not being clear? How did you resolve that? Tell me in the comments below!